Mads Mikkelsen Interview: Crazy Norse! Whether it’s thrashing James Bond’s testicles in Casino Royale or battling mythical beasts in Clash of the Titans, Mads Mikkelsen seems to enjoy taking on formidable roles. 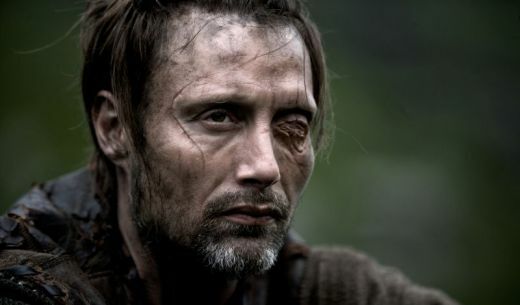 His latest movie, the existential Viking epic Valhalla Rising, sees him playing his craziest character yet – a mute, head-chopping, intestine-ripping warrior known as One-Eye. Perhaps thankfully, he’s doing a Moomins movie next. “We cut our ankles and bled all over the place,” the softly-spoken actor tells Matt McAllister. Director Nicolas Winding Refn has described Valhalla Rising as the toughest shoot he’s ever experienced. Would you echo that sentiment? It was definitely the toughest shoot I’ve ever done. We had to climb a mountain every day with lots of equipment and get around in the freezing cold without any clothes on. We cut our ankles every day and bled all over the place… It was tough for everyone. Yes, but you know what? I just did the best I could, and we weren’t trying to make this look like a Conan movie. These characters are mostly skinny people from small islands, and they don’t eat healthily. I was in good shape to a certain degree, but the mountains kept surprising us – the wind, the location… they were never what we planned. We could never really prepare for this! The role definitely needed a different approach than usual. All the normal tools of an actor were taken away here. My character has absolutely no emotion – I’m not angry, I’m not sad, I’m not happy. I’m just a thing, I’m like an animal. But I enjoy it when we don’t learn too much about characters, it can be more interesting. Not all films can do that – sometimes you need to know more about the character’s family or their past, because that’s part of the story. But in other movies it can be more interesting when we interpret things ourselves. Some people in the film think, “Oh he’s Jesus, let’s follow him.” And others say, “No he’s Satan, let’s go the other way.” In those terms, it’s open for interpretation definitely. What does the character represent to you? On a very basic level, in terms of what he physically is, he’s a slave and he’s trying to find a way home. He doesn’t know where he comes from – he doesn’t know whether he’s Norwegian or Scottish or Danish, and he can’t speak. He’s lost. But in terms of the film’s universe, I’d say he’s been there forever. He is whatever we want him to be – like religion is. We want religion to take on certain meanings, so we start making different books that describe it in a specific way. That’s what he is – he means different things to different people. I knew this wasn’t a classical Viking movie. I mean we tried to get a lot of it right – like the fact that Christianity arrived in this period, the look of the boat, things like that. But deep down, we didn’t need to study Vikings because this is not really a Viking film, it’s something else. I knew a lot about Vikings beforehand, though. I find it interesting. You recently appeared in a very different epic, Clash of the Titans. How did shooting on the two films compare? Well, Clash of the Titans is a big popcorn film that works as entertainment for audiences of a certain age. Whereas Valhalla Rising is more like a melody or meditation or a painting. They are very different – yet the approach as an actor is not that different. You just try to focus on understanding the character. Your international breakout role was playing Le Chiffre in Casino Royale. How does it feel to have played the man who whipped James Bond’s balls? (Laughs) That was a very, uh, special scene. It’s not something you’d see in every James Bond film! But it’s a really cool scene and I think it works. Was it intimidating playing a character originally portrayed by Orson Welles in the 1967 version? Yeah it was! And Peter Lorre played Le Chiffre too [in the 1954 TV adaptation]. I was following in the footsteps of giants – that was kind of intimidating. But I knew we were doing a different film, so I just focused on the script and the director and my fellow actors. Casino Royale placed me on a different map all of a sudden; it was brilliant for my career, I loved doing it. Yes. The Cannes premiere is tonight! You know what, if the image is there and the film works, it’s easy. You just go in and add to the atmosphere and energy of the picture, and you try to be that character. I got the chance to work with people like Stellan Skarsgaard and Max von Sydow on this film, so I really enjoyed it. Plus I grew up with the Moomins when I was a kid. It’s a very big part of Scandinavian culture! Valhalla Rising is released on DVD and Blu-ray on 17 May by Momentum Pictures.